In comparison with long-term average August was markedly above the average as for the temperature and precipitation. The average temperature was by 3,9 oC higher (!) compared to long-term average. The warmest period was from August 3rd to 13th when the highest temperatures got over 30 oc (8 days above 35 oC) and no rainfall came! Significant rainfall came only from August 16th to 18th August (89 mm in total), but it was too late for hops. This kind of weather together with extraordinary drought from July 10th to 31st (just 15 mm precipitation) negatively influenced flowering and afterwards cones creation as well. At the beginning of month chemical treatment against Red Spider Mite still continued and later on against Peronospora, too. The health state of hops is good. Most of the farmers started the harvest from August 22nd to 24th and it has not been finished yet. 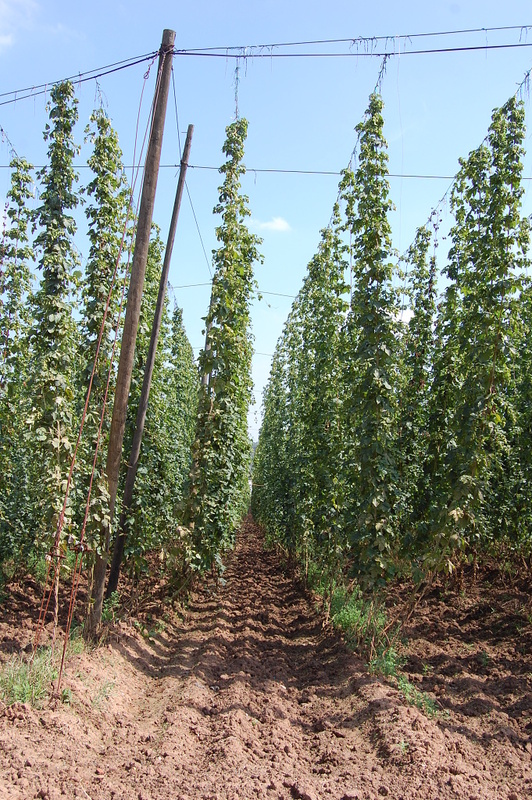 Due to the dry weather and extreme temperature hop cones did not grow up to the ususal size and remains very small. The average yield of Saaz semi-early red bine hops is estimated to be considerably substandard (aprox. 0,7-0,8 MT/ha). The average Alpha acids content is also estimated to be very low (aprox. 2,5-2,7 % EBC 7.4). Picture shows the state of hops in the time of harvest beginning.